January 9, 2019 at 12:00a.m. Accepting sage counsel from a mentor often leads to success in life and business. That happened for Austintown native Tim Ward Jr. Establishment: North High Brewing Co. Hours: Mon.-Thurs. : 2 p.m. to 12 a.m.; Fri. & Sat. : 12 p.m. to 2 a.m.; Sun. : 12 p.m. to 10 p.m. Available: Brew on premises, flights, pints, growlers, merchandise, etc. Tim Ward Sr., known as “Big Tim” at the brewery, had no idea this piece of advice would have a profound impact on his son. Ward Jr. partnered with Gavin Meyers to open North High Brewing in 2012. Once one of the capital city’s up-and-coming breweries, it’s now one of the city’s largest. Ward Jr., a 2001 Austintown Fitch graduate, studied mechanical engineering at Youngstown State University. He was hired by Honda as an engineer in 2006. While studying for his MBA at Ohio State University, Ward Jr. met Meyers. Part of their studies included developing a business plan for a brewery. The duo recognized an opportunity to bring a new kind of brewery to Columbus, one that focused on the experience of brewing. North High was born as the city’s first and only brew-on-premises establishment. 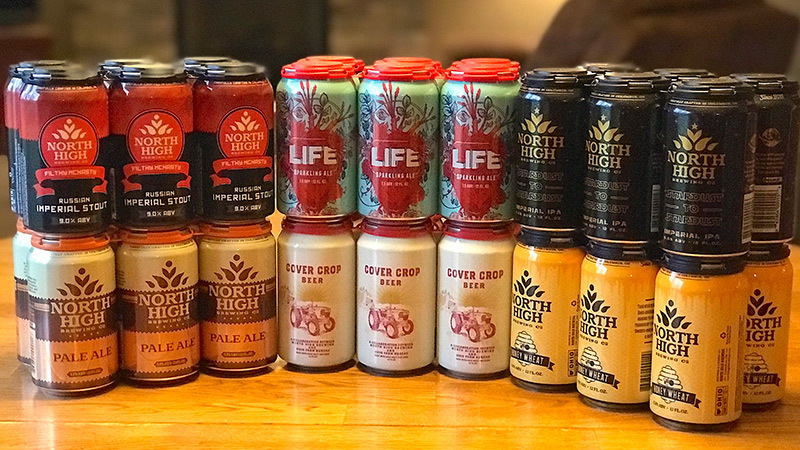 In addition to customers brewing their own beer, North High creates high-quality craft beer served in its taproom and at restaurants and bars. Its beer also is available at grocery stores and retail outlets throughout the state. Sales were up 25 percent last year. Ward Jr. expects another 25 percent increase this year. At its taproom, North High offers an array of beer from its year-round staple such as the award-winning Pale Ale, seasonal offerings and occasional taproom-only beers. There are 30 taps to please everyone from hop heads to those just getting into craft beer. Premium Beverage Supply distributes North High beers in the Mahoning Valley, and Ward Sr. helps sell beer here. North High can be found locally at Chalet Premier, Giant Eagle, Lou’s, Vintage Estate, and more locations. We met Ward Jr. at a North High beer pairing at Barrel 33 in Howland (thanks to Brian Fry). We also had the pleasure of meeting his mother, Carol, and Big Tim. Recommended Flight Pattern: Heed Big Tim’s advice. Find North High beers at your local craft beer outlet, and when in Columbus, stop by the brewery. April 19, 2017 8:35 a.m.